Let us consider the humble chicken. Or, rather, consider a world without them. Gone are breakfast burritos at Sunday morning brunch, wings at your next tailgate, half the menu at an Italian restaurant, your grandma’s precious soup recipe and nearly every fast-food chain out there. It’s a bleak world, to be sure. Given the extent to which we rely on the nameless, faceless birds that gift us so many culinary delights, perhaps it’s time we paid more attention to them. That’s the insight behind the Cosmopolitan Chicken Project, an artistic endeavor 20 years in the making. It’s the brainchild of Belgian artist Koen Vanmechelen, and it celebrates the wonder and power of the riotous diversity found in the myriad lineages of chickens the world over. Over the course of the past century or so, we have come to lean heavily on our feathered feasts, thanks to an unfortunate (for them) collection of assembly-line ready characteristics: they produce lots of offspring, mature quickly and require relatively little care. The end result is the ongoing explosion of the poultry industry. In 2010, there were around 20 billion chickens in the world, and in the poultry-loving United States, chickens outnumber people by more than six to one. In the U.S. alone, there were 277 million laying hens as of 2015, each producing an average of 280 eggs per year. And, although there are dozens of heirloom chicken breeds out there, we only come in contact with a few, at least in the U.S. Breeds like the Leghorn or the Cornish Cross dominate — their propensity to grow fast and big has endeared them to the chicken industry. We are but one nation in a world of chicken lovers, however, and cultures across the globe possess their own distinct breeds of fowl. The Bresse chicken in France, white with a red cap and blue legs bears an uncanny similarity to the French flag, while the fluffy Chinese Silkie recalls that country’s historic export. As for us, well, America just seems to like having the biggest chicken around. Coincidence or not, these auspicious variations signal the undeniable influence humans have had on chicken evolution. Ever since the red jungle fowl emerged from the forests of south-east Asia and hitched a ride on trading ships to spread around the globe, the story of the chicken has hewn close to our own. That may be good news for us, but the implications for the chicken are less fortuitous. Even setting the philosophical quandary of mass breeding aside, the resultant inbreeding poses a significant risk. Inbred chickens are not as healthy and are more susceptible to diseases like the avian bird flu, which in 2015 tore through poultry farms in the Midwest, forcing farmers to dispose of 43 million birds. For Vanmechelen, the chicken represented an opportunity to examine the effects of centuries of inbreeding and human intervention in the history of the chicken and see if there was any way to undo the culling effects of human intervention. For 20 years now he has been breeding chickens from diverse backgrounds to create what he calls a “Cosmopolitan Chicken.” Starting with birds from France and Belgium, he has added a new breed every year, drawing on chicken stocks from around the world. He brought the 19th iteration of his worldly chicken to Detroit this year to mate with an American Wyandotte, a breed of heritage chicken named after a tribe of Native Americans. Crossing breeds and entangling DNA is a fundamental part of evolution, Vanmechelen says, and his project attempts to return the domesticated bird to a more natural state. His goal is to essentially refresh the chicken genome by injecting new traits and weeding out inbred tendencies. Every time his chicken mates with a new breed, it picks up new genetic material that over time should add up to a more diverse and resilient genome. Cosmopolitan chickens will never win over industrial farmers who depend on economies of scale to turn a profit, but Vanmechelen sees a different market for his crossbred chickens. In communities in developing nations around the world, chickens represent a vital source of nutrition and income. Armed with a fortified genome, he hopes to one day integrate his chickens into native populations to spread beneficial traits among them. To this end, Vanmechelen has partnered with Olivier Hanotte, a professor of genetics and conservation at the University of Nottingham. Hanotte works with farmers in the developing world to improve the efficiency of their livestock output, and he sees the cosmopolitan chicken as a natural fit for small-scale farmers. In poor countries, chickens can be a vital, and sustainable, source of food and income for struggling families. Add that to their ease of care taking, and chickens are a solution even Bill Gates can get behind. Improving yields, survival rates and fertility in chickens living in less-than-optimal environments would bring real benefits to struggling farmers. Hanotte plans to introduce offspring drawn from Vanmechelen’s cosmopolitan chicken lineage to rural farms in Africa to see how they stack up against the native chickens in terms of performance and adaptability. He expects that they will do quite well — environments are constantly changing, he says, and the best-adapted chickens are likely to be those with the greatest diversity of traits. If the project goes well, they hope to cross the cosmopolitan chicken with high-performance chickens that specialize in egg-laying, with the goal of improving yields for farmers. Vanmechelen is producing the eggs now, says Hanotte, and will visit him soon to begin the project. Hanotte was initially attracted to the project because it represented what he says is the longest-running experiment in chicken breeding anywhere in the world. Unlike government-funded studies undertaken in labs which normally end after their grant period is up, Vanmechelen’s project began as an open-ended art installation. Only recently has it evolved into a full-fledged scientific initiative. Like Vanmechelen’s chickens, the project required a hybrid of artistic vision and scientific creativity to bring the project to life. The project isn’t meant for the vast commercial farms that supply the Western world with chickens, but Hanotte thinks that it may help to promote a subversive idea among chicken eaters here. “real benefits to struggling farmers.” Remove 90% of government regulation. Sacramento-mandated health spas for California factory chickens are Progressive madness. Hatch, plug in, run flat, eat. Ribeye costs $12/lb, chicken costs $0.85/lb. Who do the poor think they are? “Nothing will ever replace the flavor of an indigenous chicken” Affordability. Rooster combs yield sodium hyaluronate essential to eye surgery (e.g., cataract removal, IOL implantation) and doping racehorse joints – Nature’s favorite viscoelastic aqueous lubricant. The singular desirable chicken improvement is “featherless.” A large feed fraction is wasted growing feathers,cooling factory barns is expensive, and there is no good use for astounding tonnages of chicken feathers thereafter. Don’t grow feathers. 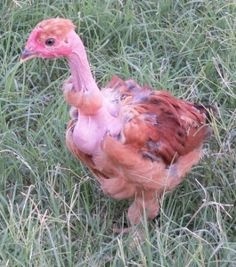 Turkens (naked necks) have half as many feathers as regular healthy chickens. Without feathers, the barn would have to be climate controlled. More like Hillary to me, when she is screaming on one of her rants.